Cimberio Valve’s fan coil kits are built according to your system’s needs. Choose a Basic Kit for simple manual on/off isolation, a Balanced Kit for more options tuned to the needs of your system, or an Automated Kit for those applications where balancing and interfacing with a building management system are needed. 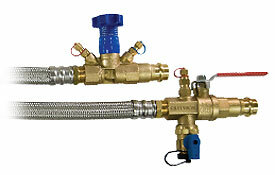 Each kit comes with several options including valve and strainer options, hose lengths, sizes, and end connections. Although there are numerous combinations you can customize for your applications, one thing remains the same — Cimberio Valve’s commitment to high quality products. Click the links below for options and details. For more information, check our brochure.